I personally felt like they'd work somehow. Something just seemed genuine. It was no secret that they'd been friends (or maybe more than that) for a while..so why not make it official? Well, here we are a year from their nuptials and I must admit I'm feeling KimYe more and more. For me it's the subtle things you catch in photos, and their public displays of affection via social media. You can really see how smitten they are. The way he looks after her, the way he looks at her, how she blushes..the way she's definitely his muse. This was most evident this past weekend as both Kimye and their families took to their social media accounts to celebrate the couples one year anniversary. You may recall they had an exclusive and incredibly beautiful wedding in Paris! Kim posted lots of pictures and tweets. Kris Jenner posted a video of the couple's first dance to John Legend singing All of Me. Absolutely beautiful! Whew! "I would find you in any lifetime." is so profound and sweet. I read that line a couple of times just for the feeling it gave me, so I know Kim felt like a gem! This media crazy generation loves a good divorce story, but I love being able to shed light on the marriages/relationships that are working! 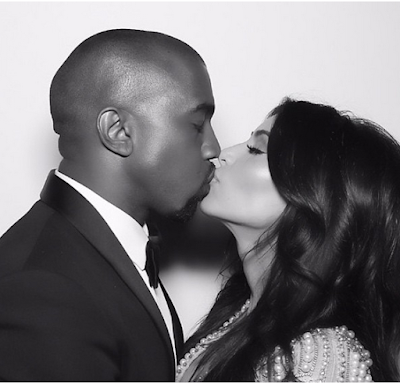 Happy Anniversary to the Wests!